Help wanted! If you’re making trees please send them my way by January 20th, 2016. Thanks guys. 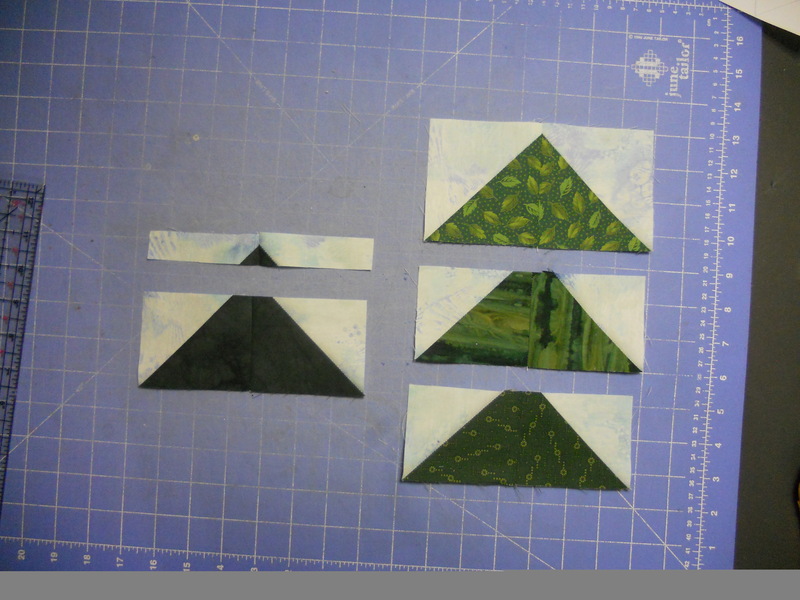 Here’s a little tutorial for the treeline border blocks my friends and I are making for the turtles quilt. 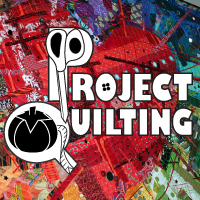 This quilt has been a collaboration from the start so it makes sense for this last bit to be made by many artists as well. If you want to help out and make one, I’d love that! As you can see from the last photograph I’ll need a lot of them to make it all the way around. You’ll need some medium/dark greens and light blues for this 8 x 11.5″ block. This can be as scrappy or not as you’d like it to be. Use one green and one blue or a bunch of ’em. Time to make some half-square triangles. Mark the diagonal line on each of the blue pieces. 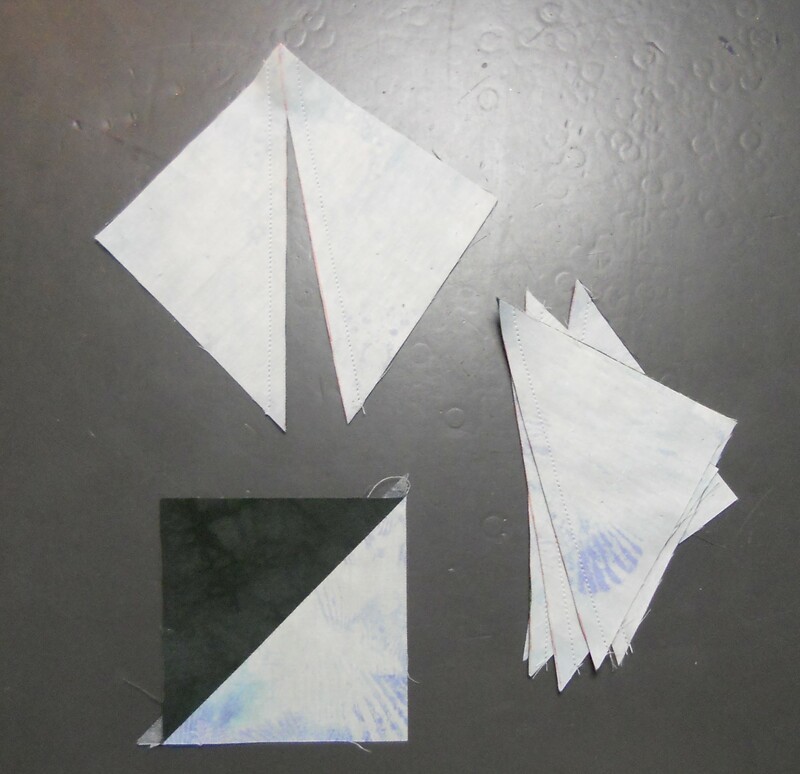 Sew them, right sides together, to the blue pieces on either side of the marked line. So, you’re going to get two half-square triangles out of each one. I like to chain-piece these, sewing 1/4 inch to the left of the marked line and then flip ’em to sew 1/4 inch to the right of it. Cut right down that marked line. Press ’em to the dark side and now you have 8 half-square triangles. Sew them into sets. You’re making a larger triangle shape with each one now. Press. Decide which piece will be the top of your pine tree. Set that one aside. Cut the other three by measuring 2.75″ from the bottom. Chop the tops off at that point and discard. Stack the pieces together and sew ’em up. Hello little tree! Border on all sides with the blue strips you cut and then trim the whole block down to 8 x 11.5 inches. This block is my own design. No need to worry about super-precise piecing on this one. This entry was posted in Collaborations, Custom Work, Tutorials and tagged camp, collaborations, crystal lake camps, pine tree, stash bee, summer camp, tree blocks, turtles, turtles quilt, tutorial on August 31, 2015 by quiltartbymegan. I showed you guys a chopped four-patch in my last post. 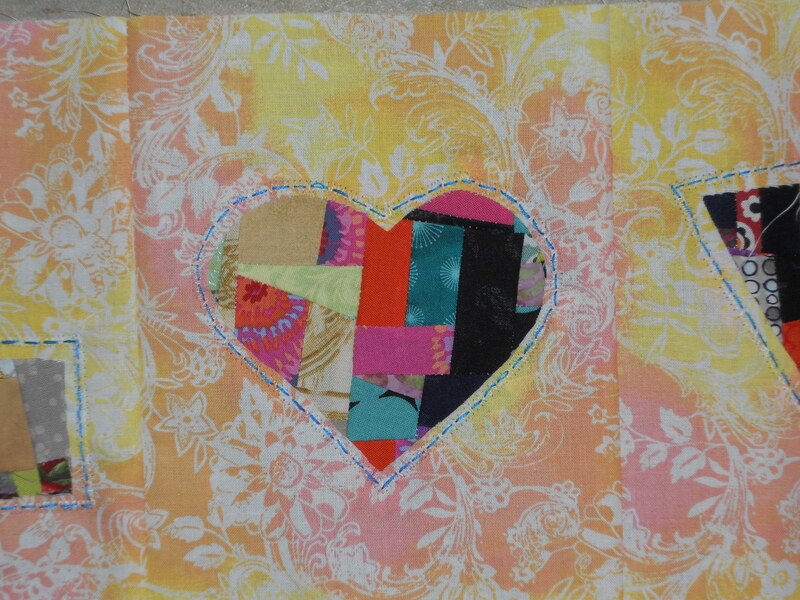 This month, in the Stash Bee, Bonnie asked for a chopped and resewn block called the intersection block. You can find a tutorial for it here. Add two borders to your center square then cut it into fourths. Flip the sections around and you get this! The block was so fun and easy that I made two. My second project for the Stash Bee is a prize. Everyone in the entire Bee (not just my small group) who sent their blocks in on time got a chance to win. I volunteered to make the winner, Amanda, a 12″ crumbs pillow sham. Her favorite color is blue and she chose a star. I made the template and traced it onto the fabric, which is larger than needed and cut down to size after appliqueing. I have quite a large crumb-block stack to choose from! I audition blocks with the star template. This one looks good. 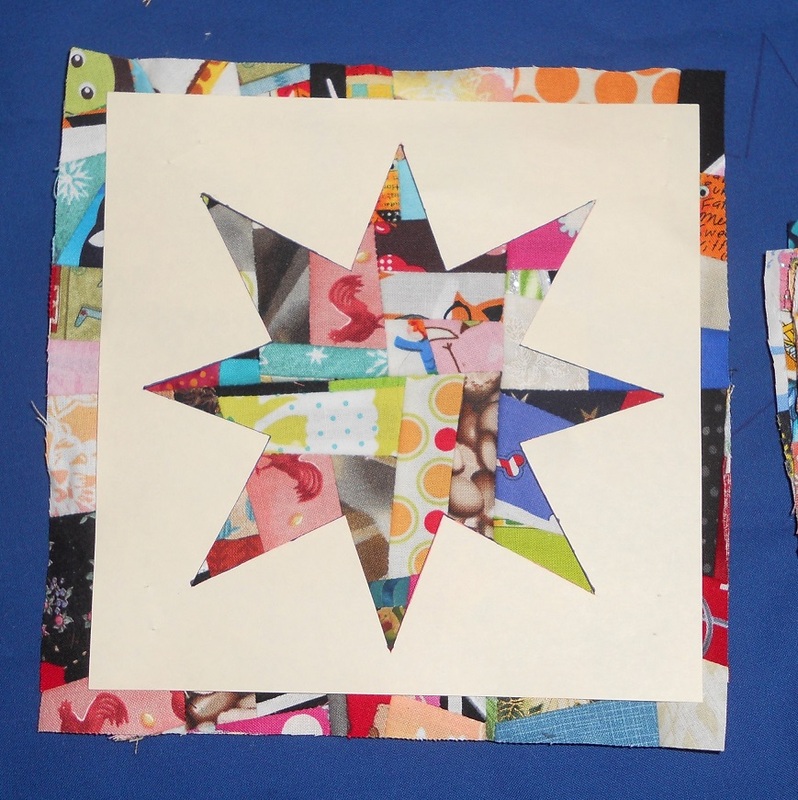 I pinned the crumb-block under the blue then zig-zagged twice around the star. The fabric inside is cut away revealing the crumbs. This method is called reverse applique. Ta-Da! Isn’t it wonderful? You can buy these in my etsy shop and, as always, I love doing custom orders. Letters, symbols, numbers and even the shapes of states are available. The next post will feature some cute baby quilts and a guest blogger! Linking up to Main Crush Monday. This entry was posted in Uncategorized and tagged 12" pillow sham, block tutorial, blue crumbs pillow, blue star, chopped block, crumbs, crumbs piecing, crumbs quilt, crumbs star, cut and resew, february blocks, for sale, intersection blocks, january stash bee prize, Main Crush Monday, MCM 7, my etsy shop, prize winner, stash bee, twisted block, winner on February 16, 2015 by quiltartbymegan. It’s almost New Year Resolutions Time. I quilt for myself, for pay, and for charity. 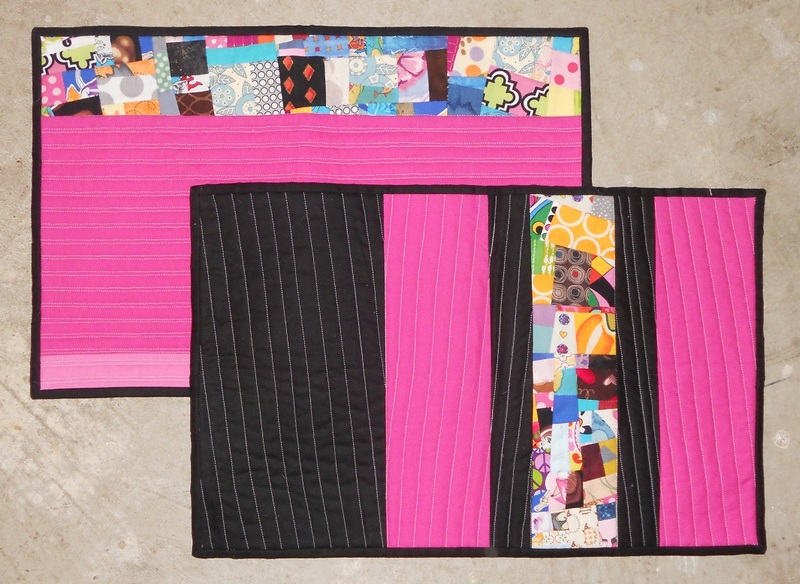 In order to get more organized I’m joining Jetgirl and a few others in making 15 quilting-related resolutions for 2015. Get organized. Keep detailed financial records for my business. Rearrange my fabric stash so I can tell quickly what I have and don’t. Market my business. Do what I know and learn what I don’t. 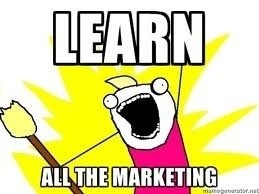 Make it a priority to really learn some new tricks. Try them out and see what works for me. Work on one charity project at a time. 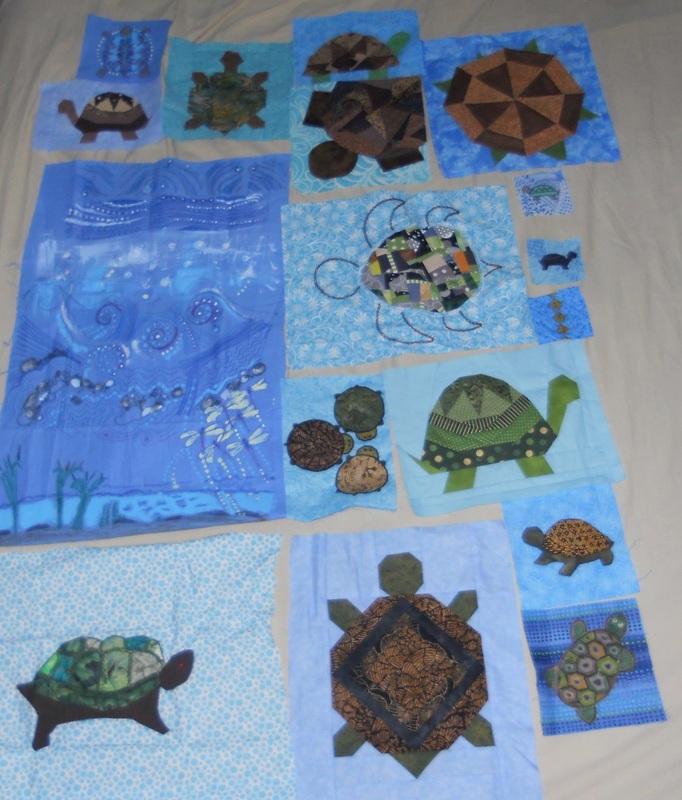 I have at least 3 charity unfinished projects and find great causes that need quilts or blocks all the time. Thing is, if my emotions are in charge none of these things will get done. One at a time and they’ll get finished and to the people that need them. First up is the turtles quilt for Crystal Lake Camps. Teach some classes! I already have one class ready to go, teaching crumb piecing. I’ll work on getting that one booked at guilds and shops as well as having more classes to offer. Try new things. You know, stuff I haven’t done before. Finish a quilt for my own bed. We have store-bought blankets on there now, along with a gorgeous hand-quilted Amish quilt. Still, it needs one of mine. My husband has been bugging me about this for a while and this year I’ll turn one of the bed-sized tops into our snuggle covers. Give myself a raise! 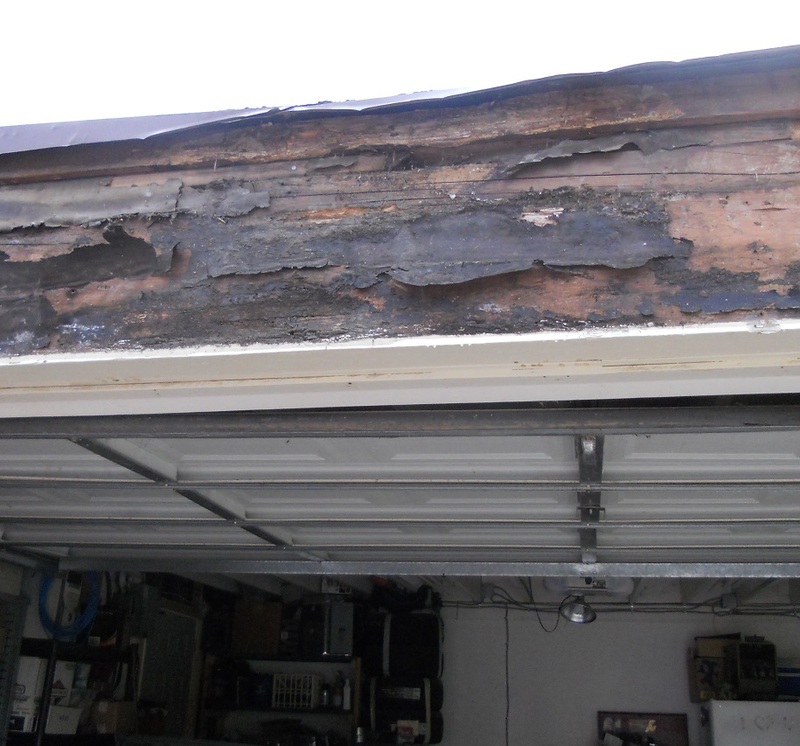 As a skilled worker, I will charge for my services like, well, a skilled worker. This year it goes up from $16.50 to $18 an hour. Learn how to better communicate with my customers. For example, I recently discovered that a good question to ask with custom work is if there’s a preference for the backing fabric. Make another large crumbs quilt. I love my crumbs piecing! I have a LOT of 6″ squares and they’re ready to go into a large quilt. Maybe it’ll end up being a show quilt like this other one I made a few years ago. Go to at least three quilt shows. Meet the vendors, be inspired by the quilts, refill my creative cup. 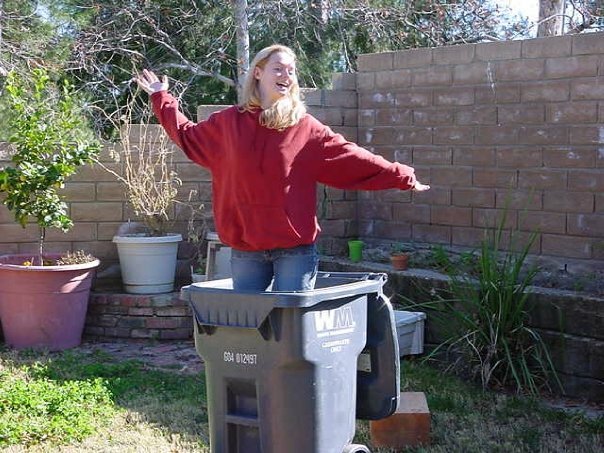 Meet some of my online friends. I have some that I know only through blogging and Facebook. I’d love to give them in-person hugs in 2015! Be silly. Laugh. Allow myself to make things just because it’s fun. Inject beauty into my artistic life. Say no. No to writer’s block. No to continuing with a project that needs to go into the donation bin. No to going to a guild meeting that’s designed to be exclusive. Trust my intuition and highest sense of self and say no when that’s the right answer for me. Quilt with friends! I’ve joined the Stash Bee and am looking forward to meeting some new online friends through that monthly activity. I’m also going to make an effort to sew in-person with mini-groups, sew-ins, at retreats, or just when my local friends have a minute to spare. Stop quilting. Know when to put the needle down. Watch a movie on the couch with my husband without my handwork. Stop the sewing machine when on the phone with a family member who’s letting me hear their secret thoughts. “One more block,” won’t do when I could be running errands before rush hour. How about you? Do you have any resolutions for 2015? This entry was posted in Art, Artist's Studio, Collaborations, Critiques, Inspiration, Quilt Shows, Swaps, The Business, UFOs and tagged 15 in 2015, be silly, clc, crumbs quilt, Family, get a raise, marketing, mini-groups, new years resolution, organize, prioritize, quilt for my bed, quilt shows, quilting, resolutions, sew worth it, stash bee, teach classes, turtles quilt, UFOs on December 18, 2014 by quiltartbymegan.